Two ZNZ members were among the winners of this year’s Pfizer research award. Dr. Thomas Wälchli and Dr. Dominik Bach received the award on February 1 in Zurich for their excellent scientific work. 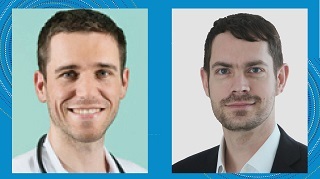 The Pfizer Research Award is granted to young scientists who have made outstanding and pioneering contributions to basic or clinical research at Swiss research institutes or hospitals. The prize money is CHF 15’000 per award. On February 1 2018, the awards were handed to 11 researchers during a ceremony in Zurich. Thomas Wälchli and colleagues described the effect of the known nerve-growth inhibitory protein Nogo-A on the formation of blood vessels and the vascular networks in the developing mouse brain. They visualized vascular structures in the brain of both normal young mice and mice lacking Nogo-A (Nogo-A knock-out mice). The analysis showed that Nogo-A has an inhibitory effect on capillary growth and the formation of capillary vascular networks. Surprisingly, the nerve-growth inhibiting protein Nogo-A also inhibited the vascular density in the growing mouse brain, especially at the capillary level and regulated the integration of blood vessel networks. These findings significantly enhance the understanding of how the formation of new blood vessels (angiogenesis) is regulated during central nervous system development. Nogo-A may therefore be a novel drug target for angiogenesis-dependent central nervous system pathologies such as brain tumors or stroke. The aim of the research group led by Dominik Bach was to investigate a putative therapeutic approach for traumatic memories in humans. Based on in vitro studies, the researchers hypothesized that the antibiotic doxycycline can influence the synthesis of proteins involved in memory formation, through inhibition of metalloprotease 9. In their clinical study, just under 80 healthy volunteers learned to combine a specific color with mildly painful electrical stimuli. One group received 200 mg of doxycycline prior to the experiment, the control group received a placebo. Seven days later, the colors were presented again and the startle reaction (a measure of the strength of unpleasant memories) was measured. Whereas the placebo group showed an intensified startle reaction to the color associated with painful stimuli, this reaction was reduced by 60% in the doxycycline group. These results show that doxycycline can reduce the formation of unpleasant memories in healthy individuals. This now leads to the next question, namely whether doxycycline can also weaken existing memories and possibly be used for post-traumatic stress disorder.